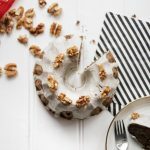 This recipe for Vegan Coffee Walnut Cake has simply turned out so much better than I would have dreamed – and funnily, it came about in a pretty spontaneous kind of way. What to do when you have too many walnuts in the house? Right, a walnut cake. And what goes with walnuts better than anything else? Coffee! 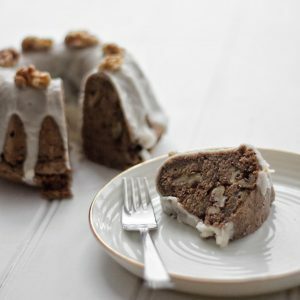 What a perfect snack this Vegan Coffee Walnut Cake was – especially with the sweet chai-style topping! Delicious, yet simple recipe for Vegan Coffee Walnut Cake finalised with a vanilla chai frosting. Mix the flaxseeds with the hot water and set aside for 10 minutes. Mix the flour with the baking powder and cinnamon, then add in a handful of walnuts, leaving some nuts left over for the cake decoration at the very end. In a large jug blend the coffee and soy milk with the maple syrup, then add the rapeseed oil. Once combined, add the flaxseed-mixture to the flour-mix and slowly add the liquids whilst stirring with a spatula. Oil a baking tin (I used a round one!) with coconut oil and add the mixture to the tin. I prefer not to use baking paper for my cakes, as it gets easily stuck on the cake and ruins it. Instead I prefer oiling the tins and then lightly dusting with a little flour. Bake in the oven for 30 minutes at 180 degrees, remove the cake and let it cool completely before adding the icing. Add 2 cups of icing sugar to a bowl, then slowly add the chai tea and vanilla essence whilst stirring with a fork. Add in a little soy milk until the mix is smooth, but thick. If it gets too runny, add more icing sugar. The consistency is supposed to be thick, but not crumbly. 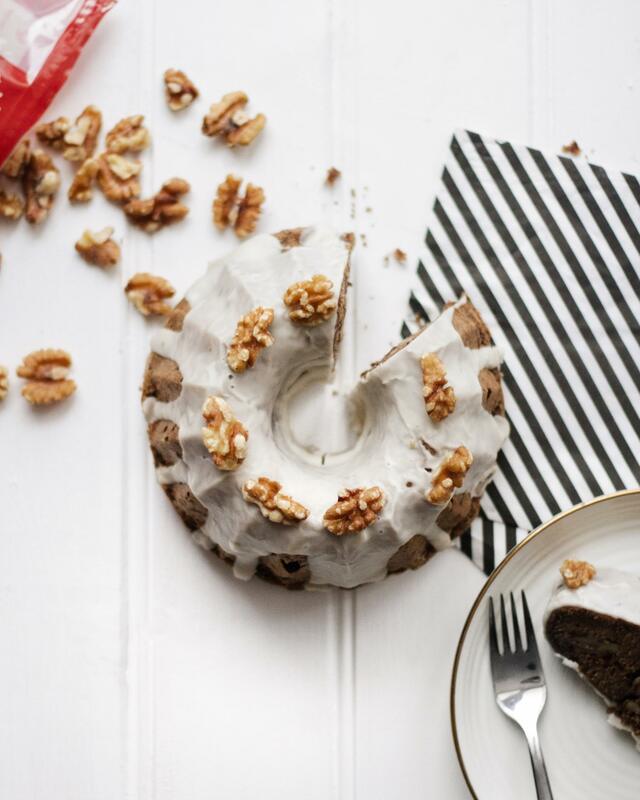 Gently pour the icing onto the cold cake, decorate with the leftover walnuts and transfer the cake to the fridge to set.